Box made to house the albums Welcome To The Pleasure Dome + 9 and Liverpool + 4. 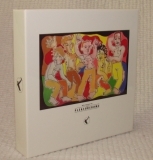 Cover:Original Welcome To The Pleasuredome artwork, with the FGTH 'man holding fish' logo on the spine. The box seems to have been made for more than the two LP's.